This week we’re looking at three common misconceptions that I’ve seen as churches consider launching into the multiplying their influence through this becoming a multisite church. I’ve seen these misconceptions in the churches I’ve worked directly for . . . and in the churches I’ve served in an advisory role. Those are almost direct quotes I’ve over heard from church leaders considering multisite and whether or not to use video as the way to deliver teaching within the adult service at the new locations. Each of those leaders today have thriving multisite ministries leveraging video as a part of their strategy. I understand why church leaders feel creeped out by video teaching . . . the fact is that many other leaders have felt the exact same way . . . but what many have found is that it’s an incredibly effective way to help reach more people, more quickly! Although video teaching is a critical element within the multisite movement – the fact is that the majority of multisite locations don’t use video exclusively to deliver content. [See the 2010 Multisite Report for More info] It’s not the only way to deliver content for your multisite . . . but should be carefully considered and not dismissed with a tangential consideration. Biggest Non-Issue – In most ways, it’s the easiest thing to replicate. Getting the teams, groups and community culture to replicate in a new location is considerably more difficult than producing “passable” video. The “Resisters” Aren’t Your Target – It seems to be that the people who don’t like this approach to teaching would probably be complaining about something at your church . . . they’ve just picked this to be the thing. They typically aren’t the people who you are trying to reach. People are trained to consume images – In some weird way – I think it makes communicators better when they are on video. People are trained to take in content through this format. They’ve been conditioned to listen and learn through video . . . they receive more “content” through that form than watching a live speaker on a stage. Releases more people into leadership! (Including more teachers!) Building up larger centralized locations limits volunteer opportunities … spreading the church through multisite creates more volunteer opportunities! That includes more spots for people in teaching roles . . . there are more spots to exercise the gift of teaching than on main stage on Sunday morning! Later this week we’ll be looking at probably one of the biggest pain points early on for a lot of multisite churches! I thought I’d share my own perspective being a “sheep”, as well as a volunteer and leader in a multisite church. I’ve also been at both ends – the live, “production” site, and now at one of the satellite locations. I think I still prefer the live teacher on stage, but the fact is that the teaching (content) is the same whether I see it shared on stage, watch it through a big screen or listen to it on my iPod – the point for me is to focus on the message and what I’M going to do with it, not about judging how it was presented. But it’s something I had to learn (after some unlearning! :)). In that sense, how the teaching is presented is really, in my mind, a non-issue. What really matters is the COMMUNITY that is around you, and that you actually get involved not just in being a “member” of the family/community, but in serving each other and trying to learn, discuss and APPLY the teaching as individuals and as a group. 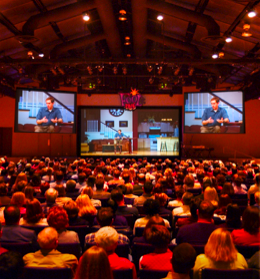 I could see video-teaching not being ideal in churches where the “community time” is focused on the Sunday. But where the “small groups”, “life groups”, “home churches”, etc. are part of the “community-intimacy strategy”, it should help facilitate the replication of the community experience, the communication of the core message of the gospel, and the expansion of the church and God’s kingdom on earth. 2) With video, the communicator’s face is zoomed in on the screen. It’s a fact that most of the body language is communicated in the face. Even with a life communicator on stage, the audience in the second row will be looking at the screen shot, rather than directly at the life communicator. 3) Frees up a ton of sermon prep time for the leader of the church to do the millions of other things that a leader needs to do. I am currently wrestling through how to do multi-site well in our context and this is incredibly helpful… especially Sanford’s comments above. The one thing that I do not hear discussed, whether it is because there has not been any research done or multi-site is still too new, is what message is subconsciously sent to our congregations, and how are they changed by this delivery method? Rich…so true! It’s the biggest fear of multisite (video teaching) and the biggest non-issue. People in the main auditorium who are 15 rows back watch the screens. People adjust to the video within minutes if not seconds.